Nightlights are obviously a necessity, but not all nightlights are created equal. If you’re tired of those little LEDs that plug into your wall and stay on constantly whenever it’s dark, we have another option for you to check out. The Vansky Motion Activated Bed Light is an LED light strip and motion sensor combo. It installs under your bed in seconds, and then it casts a beautiful glow anytime you step out of bed so you can see where you;’re walking. 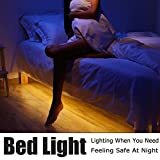 It’s awesome, and since the light is coming from under the bed it won’t disturb your partner. Clip the on-site coupon to save $2 and drop the price to $21.